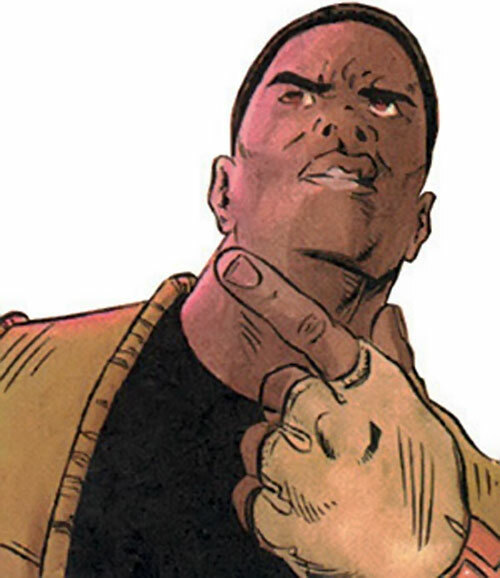 Wise Son was a major character in Milestone Comics’ Blood Syndicate. This book was part of the Milestone launch in 1993. Known Relatives: Edmund White (son), Lark Calendar (mother of his son and another child by Wise Son who had not been born when the Blood Syndicate series ended), Hildegarde (cousin), Ms. White (mother), Cornelia (sister). Possessed of an ultra-dense molecular structure, Wise Son is, to the extent thus far demonstrated, beyond the reach of physical harm. He can still be stunned or knocked unconscious (as demonstrated in his fight with Icon), though this requires quite a bit of effort. He discovered in the latter part of his career that he could also temporarily bestow some of his protective powers upon others while touching them. It is unknown whether he could extend his healing properties (i.e. his DC Heroes RPG Invulnerability) to others as well. 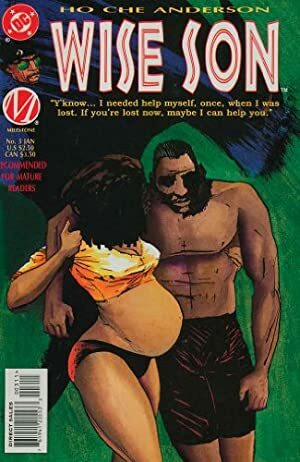 Wise Son is a Bang Baby, a gang member who received superhuman powers in the wake of the Big Bang. The Big Bang was supposed to be a rumble between all of the major gangs of Paris Island to settle their turf wars, once and for all. The Dakota City Police Department learned of the impending showdown and developed a special tear gas that also contained a radioactive marker. Their plan was to use the gas to break up the Big Bang. Then they would trace the gang members down the next day by tracing the radioactive “tags.” Instead, most of those exposed to the tear gas died, and the handful of surviving gang members that lived had all developed superhuman abilities. One of the Bang Babies, Rolando Texador, took the name Tech-9 after his favorite type of pistol. Texador gathered his fellow survivors together with a proposal. 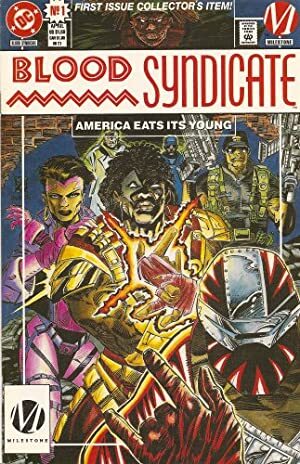 Tech-9 wanted to form a new gang, the Blood Syndicate, with the aim of achieving substantive positive social change. They took over an abandoned door factory, which they simply dubbed The Factory. Operating from The Factory, the Blood Syndicate smashed crack houses throughout Paris Island. They were trying to rid the neighborhood of the dealers while taking the money captured in these operations to fund their activities. In the course of their work they would acquire new members, and put an end to many threats in Paris Island. Wise Son assumed leadership of the Blood Syndicate after the death of Tech-9, though he was not as capable a leader as Tech-9 was. Indeed, Brickhouse and Third Rail left the Syndicate for a time because of their dissatisfaction with Wise Son’s leadership. As time went on, Wise Son grew into the role. He became an active influence in the community as a whole. He was even able to stop a riot during the Utopia Park project by speaking to the crowd. One result of the Final Crisis series was the integration of the Milestone Universe into the mainstream DCU. The cataclysmic events therein destroyed the universe in which Milestone took place. But the powerful psychic Dharma was able to harness the power of Rift, the powerful being behind the original Milestone/DC crossover, to save his universe’s inhabitants. Wise Son is an intense-looking African American man. He usually dresses in civilian attire — jeans, tennis shoes, a t-shirt, maybe a denim jacket. He often wears a dark blue baseball cap with a lunar crescent and a star embroidered with gold on the front — which he uses as symbols of Islam. Wise Son was a very angry man. Angry with the injustices of American society, angry with the violence on his streets, angry with the circumstances of his personal life. He turned to Islam to get a sense of empowerment. Yet he only followed the trappings and eschewed the actual teachings and lifestyle. During his time with the Blood Syndicate Wise Son has matured a great deal. He learned to deal with his emotions more rationally. He embraced Islam as an uplifting influence instead of simply paying it lip service. Wise Son has become an inspirational person, and was actually able to stop a riot by addressing the crowd. A similar progression of maturity can also be seen in Wise Son’s personal life. Initially he was a self-serving misogynist who actively avoided responsibility toward the others in his life. The events of the Blood Syndicate series and even more notably the Wise Son: White Wolf mini-series made him rethink his priorities. Wise Son consequently became more actively involved with the lives of his family, his children, and their mother than he was before. The Big Bang and the Blood Syndicate can dropped into any urban area where gang activity plays a major role. Wise Son can be used individually as an angry urban rabble-rouser who evolves into a genuinely gifted community leader. Force Field is Always On, is normally Self Only, and allows normal interaction (including the ability to Attack Through Field) with other objects. In other words Wise Son is always protected from damage but can touch and feel things normally (total cost of Power with these adjustments is BC: 60, FC: 07). Force Field can be extended to protect others in direct contact with Wise Son, with all of the same traits as above applying (+2FC). Area Knowledge (Paris Island), Expansive headquarters (The Factory, though the Blood Syndicate may have a new base of operations after its disbanding and subsequent reformation), Expertise (Islam), Leadership. At the start of his career Wise Son was not as gifted nor as inspirational a leader as he is now. For the early Wise Son, lower INFL and AURA by 1 AP, SPIRIT by 2 APs, lower HPs to 50, and drop Charisma and Leadership. His Expertise (Islam) was only a Familiarity at that time due to his superficial knowledge and very limited adherence to its principles. Wise Son did not know he had a Force Field that was Usable on Others until his battle with the Ivory Fists in the Wise Son mini-series. By Kynn Bartlett, edited by JD and Roy Cowan. Helper(s): David J Oakes, milestone.luthor.com (defunct).